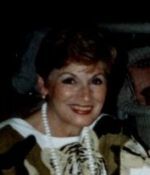 Obituary - Anne Z. Castellano - Bentz Funeral Service, Inc.
Anne Z. Castellano, 91, of New York Mills, passed away Sunday, February 17, 2019 at the Presbyterian Home for Central NY. She was born June 26, 1927, in Utica, the daughter of the late Angelo and Barbara Guarini Zizzi and was a graduate of Proctor High School. On July 17, 1948, at St. Mary of Mt. Carmel Church, Utica, she married S. Michael Castellano, a loving union of almost 43 years. He passed away January 2, 1991. Mrs. Castellano was a secretary at North Western Mutual Life Insurance Company and later was an executive secretary with the US Post Office in Utica, retiring in 1992. She was a parishioner of Our Lady of the Rosary Church in New Hartford. She is survived by her daughter, Luanne Castellano of New York Mills; her son and his companion, James Castellano and Deb Jansen of Ponte Vedra, FL; her grandson, Michael Castellano of Columbus, OH; two nieces, Janet Rumbutis and Anne Barbara Dunn; her nephew, Stephen Zizzi; two great nieces, Kimberly D'Auria and Lynel Rumbutis; and her feline companion, Mimi. She was predeceased by her son, Richard Castellano; her brother, Joseph Zizzi; and her sister, Palma Mercurio. A Mass of Christian Burial will be celebrated on Saturday, February 23 at 12 noon at Our Lady of the Rosary Church, Burrstone Road, New Hartford. Private interment will be in Calvary Cemetery. Calling hours are Friday from 5-7 pm at the Bentz Funeral Service, Inc., 13 Oxford Road, New Hartford. Luanne and Jim wish to extend a special thank you to the nursing staff of the Presbyterian Home, for the comfort they provided to their Mom. They will be forever grateful.